Note: Stereo and bridged amplifier PCBs are available for this project. 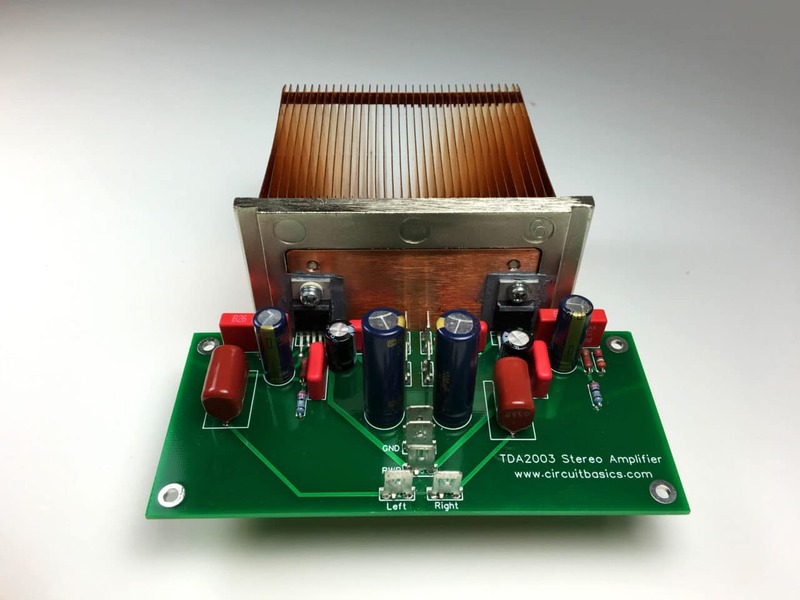 The TDA2003 is a low cost audio chip amplifier that can put out some really nice sounds. It’s typically used for car audio amplifiers, but it also works great as a bedroom amp or anywhere else you need good audio without tons of power. 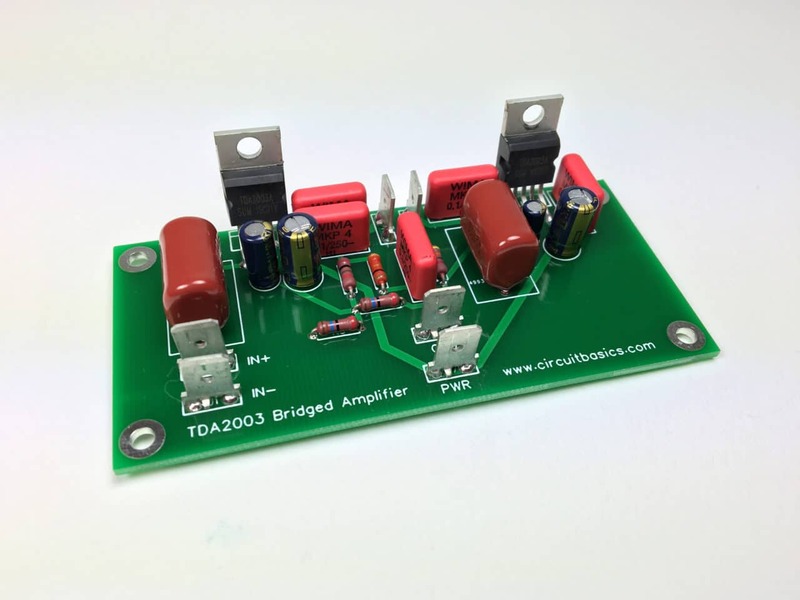 In this tutorial, I’ll show you how to build two different amplifiers with the TDA2003. The first is a stereo amplifier that will output 7 Watts per channel. 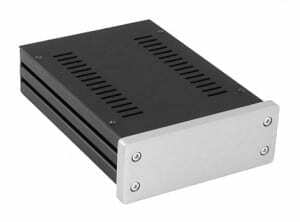 The second is a bridged amplifier that can output 14 Watts per channel. 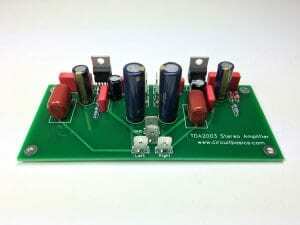 This stereo amplifier will output about 7 Watts per channel into 2 Ω speakers with a 12 V power supply, but more power can be had with a larger power supply voltage. BONUS: Download my parts list to see the components I used to get really good sound quality from these amplifiers. Capacitors C15 and C17: Reduce hum caused by radio frequency interference. Resistors R9 and R10: Prevent a loud buzzing sound when no source is connected. 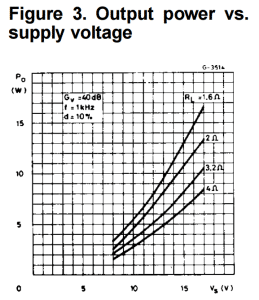 The voltage gain can be thought of as the amplification factor, or how many times the input signal is amplified. It’s important to use low tolerance resistors for R1, R2, R6, and R7. If their resistances aren’t precise, the gain will be different on each channel and make one side louder than the other. Your best bet will be 0.1% tolerance metal film resistors. 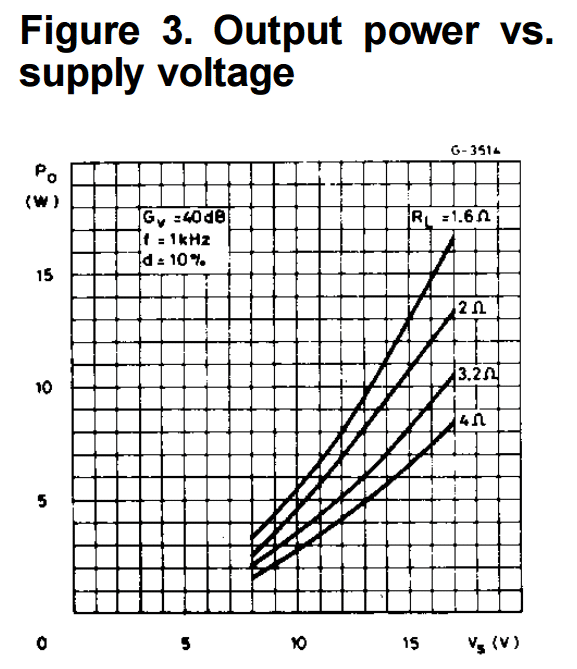 The amplifier’s bandwidth determines which frequencies are amplified and which are ignored. The TDA2003 has a low pass resistor-capacitor (RC) filter at the output that filters out all frequencies above a certain cutoff frequency (Fc). All frequencies below the cutoff frequency are passed on to the speakers. So all frequencies above 104.6 kHz are filtered out, and frequencies below 104 kHz are output to the speakers. If you want to experiment with higher or lower cutoff frequencies, the equation above can be rearranged to solve for a resistor or capacitor value depending on your desired cutoff frequency. Capacitors C7 and C3 in the left channel and C9 and C10 in the right channel are the power supply decoupling capacitors. 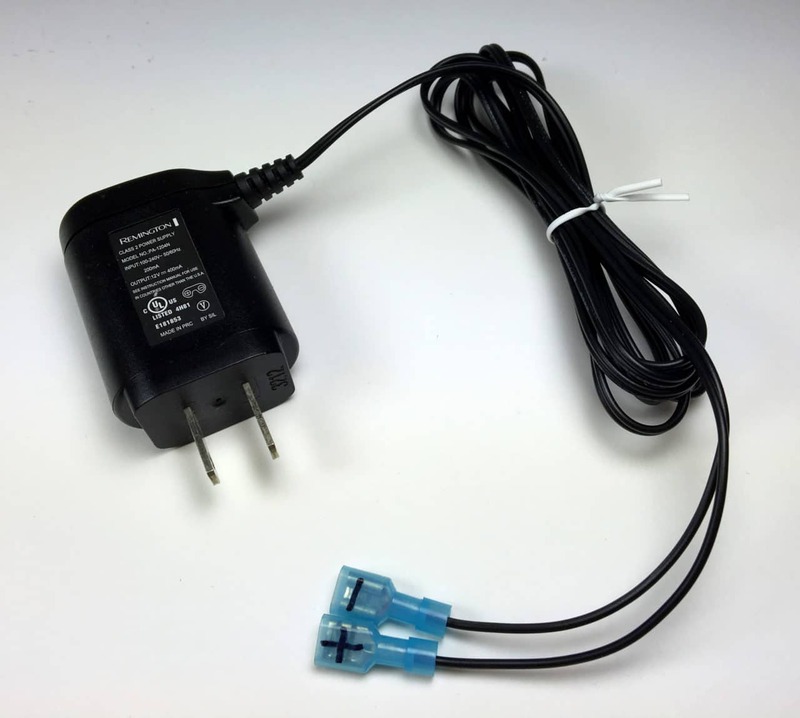 They provide a quick and lasting supply of current to the chip during periods of heavy output and also filter electromagnetic interference in the power supply. You can use other values than what is shown in the schematic, but each chip should have at least one small value capacitor between 1 µF and 100 nF, and one larger value capacitor greater than about 47 µF. The TDA2003 has a great high frequency response but the bass can be a little weak for some people’s taste. One way to improve the bass is to increase the size of the output capacitors (C4 and C12). You can go up to 2,000 µF or 4,700 µF, and even higher if the space allows. Another way to get a better bass response is to increase the size of the larger power supply decoupling capacitors, C7 and C10. These capacitors act as a reservoir of energy during periods of increased low frequency output, so larger values will allow the amp to handle heavy bass better. 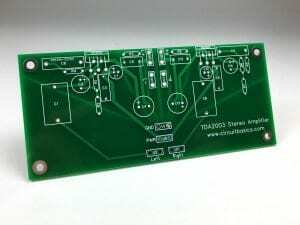 Below I’ll explain some of the concepts that went into the design of the PCB I used for my stereo TDA2003 amplifier. Note: The component labels on the PCB correspond to the labels in the schematic above. The power supply decoupling capacitors are placed right up against the TDA2003’s supply voltage pin (pin 5). This is to reduce the length of the traces connecting the capacitors to the chip. Longer traces have more parasitic inductance, which inhibits the flow of current. Parasitic inductance can also cause the amplifier to oscillate when a capacitor is connected with a long trace. Oscillation will create noise in the amp’s output and may cause it to overheat. You can avoid this by keeping components close to the chip and using short traces. The TDA2003 can be a bit tricky when it comes to grounding. Poorly designed grounding layouts are a common source of noise and hum. To keep hum to a minimum, the high current power supply and output grounds should be kept separate from the input and feedback loop grounds. This can be accomplished using a star ground. I used a star ground with a ground plane on the bottom layer of the PCB. In a star ground, each ground connection has a separate path to a central ground point. In this PCB, the terminal where negative DC power is connected to the PCB serves as the central ground point. The ground planes help to reduce noise because they shield the circuit from radio frequencies. They also reduce the loop area of the circuit, which prevents the traces from transmitting and receiving electromagnetic fields. 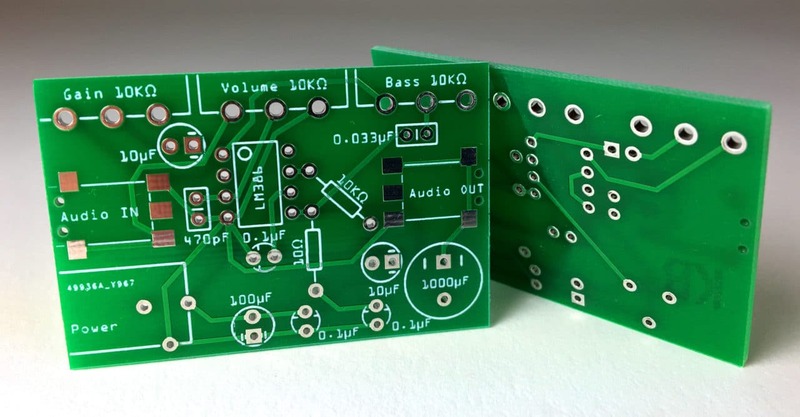 For more tips on PCB design, check out our article How to Make a Custom PCB. In a bridged configuration, two amplifier chips power a single speaker. The output of one chip drives the positive speaker wire and the other chip drives the negative speaker wire. The output of one chip is 180° out of phase with the other chip, so when the output voltage of one chip is positive, the output voltage of the other chip is negative. This has the effect of doubling the output voltage, and doubling the output power into a speaker of twice the impedance. For example, in the stereo amplifier above we got 7 Watts per channel with a 12 V power supply and 2 Ω speakers. In bridged mode, we would get 14 Watts into a 4 Ω speaker with the same power supply. 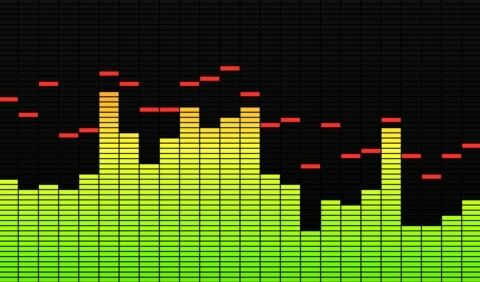 You can increase or decrease the gain by changing the value of R2, but I’ve found that 13.5 Vo/Vi is a good gain setting for listening in a bedroom. So all frequencies below 159 kHz will be passed on to the speaker. The component labels on the PCB correspond to the labels in the schematic above. 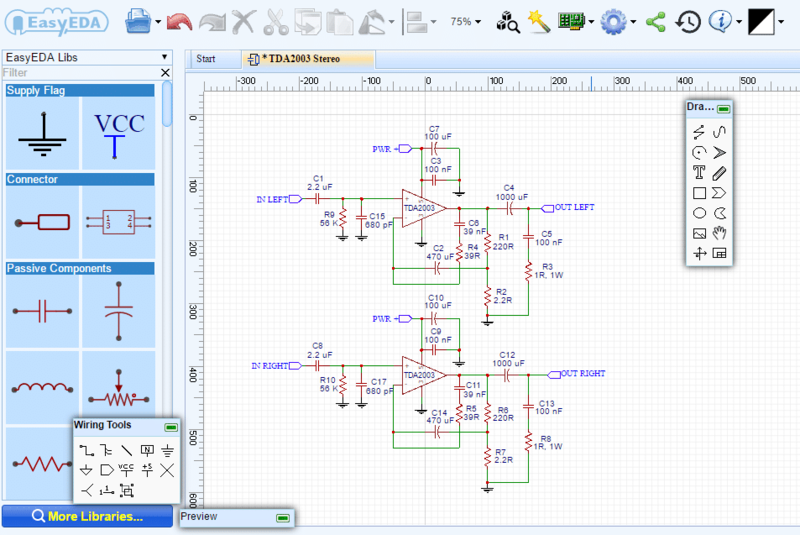 You click on the image above to edit the layout, change the component footprints, and order PCBs. The components you use in your amplifier will have a major effect on the sound quality. The information below should help you get the best sound without breaking the bank. Metal film resistors are the best choice for audio. 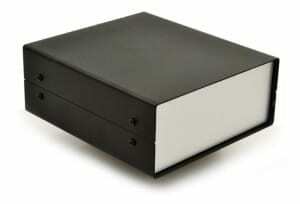 They’re less noisy than standard carbon resistors, and are available in tighter tolerances. Better resistors will have lower tolerance and lower temperature coefficients. 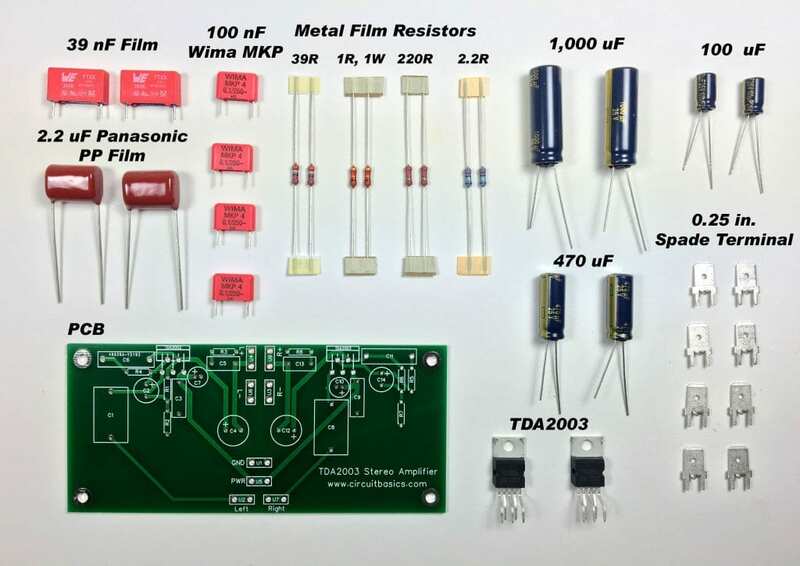 More expensive audio grade resistors like the Vishay-Dale PTF or Welwyn RC series are great, but you probably won’t notice much difference with cheaper metal films from TE Connectivity or KOA Speer. Capacitors can be very expensive if you go for the high-end audiophile brands. However, you can still get great sound from less expensive ones. For small value capacitors less than 1 nF, polystyrene is your best bet. For values between 1 nF and 4 µF, polypropylene film capacitors are best. Wima MKP polypropylene capacitors are good (and cheap) for the 100 nF decoupling capacitors. For the larger value capacitors, electrolytics are the only option. 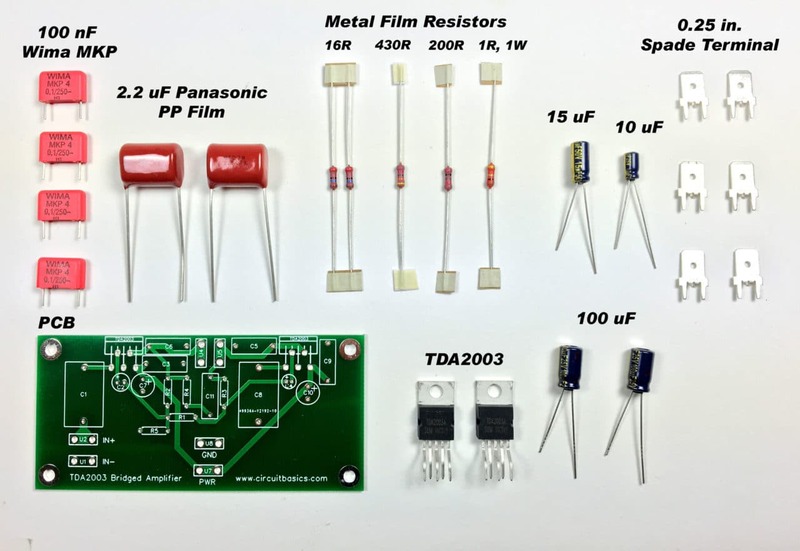 The Panasonic FC series is great value for the money, but a step up from those are the pricier Nichicon KZ series or Elna Silmic II capacitors. 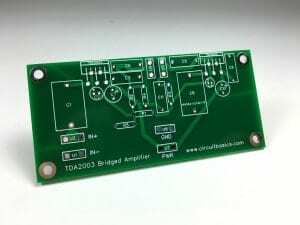 With this power supply, the TDA2003 stereo amplifier will output about 7 Watts into 2 Ω speakers, and the bridged amp will output about 14 Watts into 4 Ω speakers. Each TDA2003 chip needs to be attached to a heat sink to dissipate the heat it generates. Without a heat sink the chip will get extremely hot very quickly and become permanently damaged. An aluminum heat sink around 150 x 60 x 25 mm should work fine for two chips. The metal tab on the back of the TDA2003 is connected to the ground pin (pin 3). If you connect two chips to the same heat sink, it’s best to isolate them electrically with an insulating washer and pad to prevent hum. For the best heat dissipation, use thermal paste on the back of the chip, the insulating pad, and the heat sink. Pro Tip: Old desktop computers have lots of useful components you can use in an amplifier build that will save you money. A single desktop may have as many as four heat sinks, insulating washers, a couple fans, an IEC connector and power cord, and lots of fasteners. Installing your finished amplifier in an enclosure or chassis is a good way to make it more user friendly, and it will look much nicer too. You can use any type of box depending on what you can find, but metal enclosures are preferred since they offer shielding from interference caused by fluorescent lights, radios, and cell phones. Both amplifiers sound great. The mid frequencies are very detailed, and the highs are not harsh at all. The bass lacks a little punch, but the overall sound is very well balanced. The stereo amplifier sounds a little bit cleaner than the bridged amplifier, but the bridged amp has noticeably more power. However both amplifiers have more than enough power for listening in a bedroom. 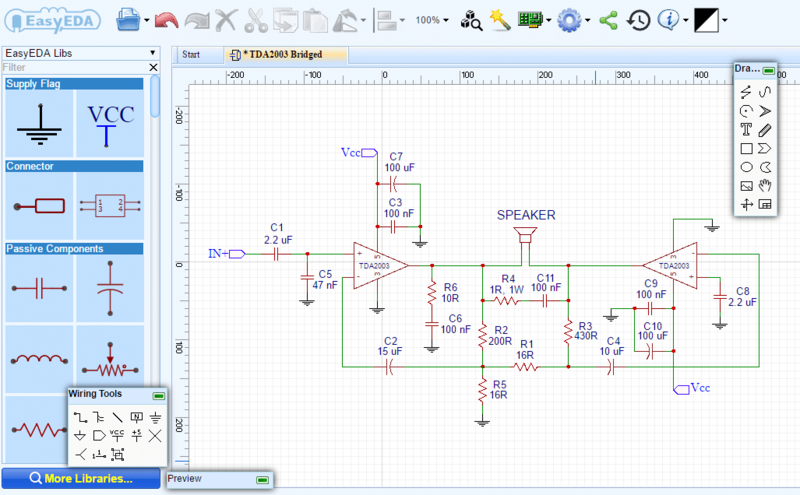 This is a great project to build if you’ve never built an amplifier before. 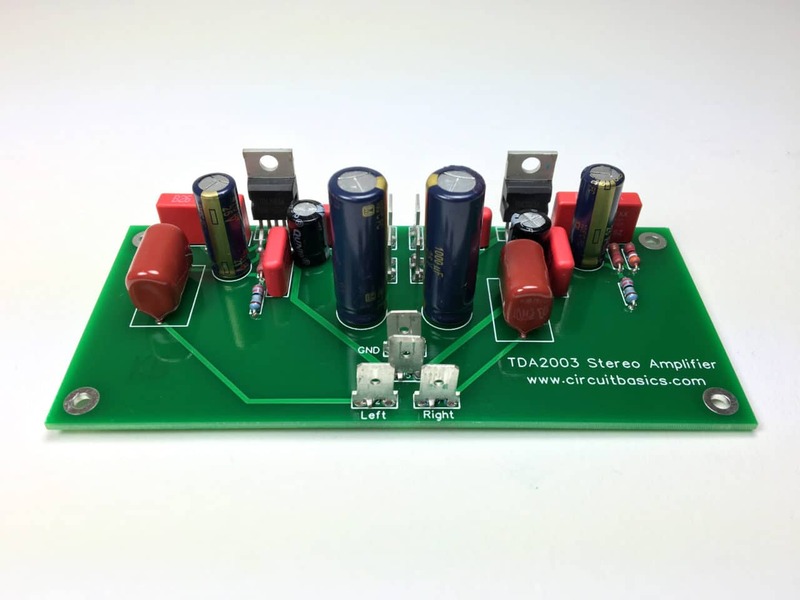 If you want something with a bit more power than these amps, check out our tutorial, How to Design and Build an Amplifier With the TDA2050 where we build at 25 Watt TDA2050 stereo amplifier. 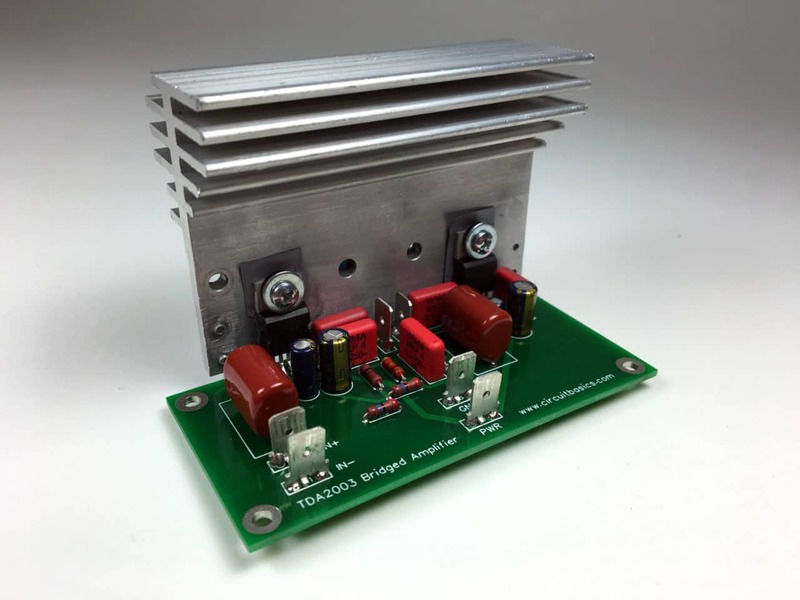 If you’re looking for audiophile quality sound, we also have a build guide for a 40 Watt Hi-Fi LM3886 Amplifier. These amps are a bit more complicated than the TDA2003, so if this is your first chip amp project I’d definitely suggest starting with the TDA2003. I see your project very interesting. 1. I added 2 variable resistors 10k before the capacitors C1 and C2 to adjust volume for the left channel and the right channel. Is that right? 2. If I right, How to use only one variable resistor for adjusting the volume on 2 channels? Does any circuit do this instead of using “dual gang potentiometer”? can I use the LM380 instead of TDA2003 in the above circuit? AWESOME! Post. It gives me a clear conception about BRIDGED AND STEREO AMPLIFIERS. I have a question about the bridged Amp: where do I need to place my potentiometer, in order to be able to adjust the volume? and what value does it need to have if my input source has a maximum voltage of 2Vrms? Electronic circuits is a total new hoby for me and I found this site and it is a good start.for me. I am for several weeks ordering the parts from the partlist and they are finally at home. Now I did the final check befor starting solder the bridged amplifier. I do not mean it critacal but I see some differences in the pictures from the amplifier relative to the PCB before soldering. There is part missing namely: C5 47 nF Xicon Polystyrene and I am wondering when it is added? And when you order it by Mouser from the partlist it is an 4.7nF a diffent value. For me (I am not an electrician) it is very confusing. Mabey you can say something about this point before I solder. I wonder if it is possible to replace this capitator for a (M) KP capitator with the same value? How much maximum output can tda2003 give in reality if built using the components given in test circuit ? I wanted to ask, what is the resole that you used, high voltage capacitors in a circuit that will work on a supply of 12 Volts. 12dc is the voltage required for activating chip circuits but into different paths of the circuits AC current is passing and that ac current with its high frequency generates high voltage at different stages hence high voltages capacitors are used there. Hi, could I use this amp suitable for headphones? Would I have to modify/add something to the circuit? Thanks! I am wondering if you have posted a circuit with the (venerable, obsolete but still available) TDA2030A, especially in BTL mode. I would be obliged if you did that. Alternatively can I safely assume that the TDA2030A can be substituted in the TDA2050 bridge circuit but with a different power supply and thus different components values? If yes, what would these PSU requirements and new component values would be.